OS grid reference: NY 9004 1241. This is a difficult one to reach. You will need to park in one of the east-bound lay-bys beside the A66 Stainmore Pass dual carriageway on the summit and then find a stile allowing access to the earthworks of this 1st century AD Roman marching camp at Buzzard Hill. [A word of caution here please do be very careful as the road can be quite dangerous]. The almost rectangular-shaped earthworks are much more prominent once you get close up to the site. Most of the camp lies on the north side of the road, but a section (south-side) can be found on the opposite side of the A66, near the river Greta, although it is probably not worth crossing over the road for. The camp was probably built sometime between 70-72 AD when the 6,000 strong IX legion under the Roman governor Quintus Petillius Cerialis came to the north of England to subdue the Brigantes and Venutius, husband of the warrior Queen, Cartamandua, then forming a rather tenuous alliance. Petilius later defeated and murdered Venutius at Stanwick c72 AD. The A66 follows the course of the Roman road between York (Eboracum) and Carlisle (Luguualium), but it seems the road was constructed slightly later than the marching camp in the early 1st century AD? eventually linking many camps, forts and fortlets along the way, including those nearby at Bowes Moor, Bowes (Lavatris), Maiden Castle and Brough (Verteris). It is, however, believed Rey Cross marching camp was only occupied for a temporary period, perhaps a few weeks, months or a year? The camp appears to have been re-occupied during the 3rd-4th centuries AD because some pottery has been excavated from that period. The earthworks are spread over 20 acres or 296 metres from east to west and 144 metres north to south with fairly strong ramparts of stone and earth and, an external ditch. At the south side these ramparts still stand to a height of approx 6 feet in the centre and approx 20 feet wide at its base. But the northern ramparts are much more intermittent and less strong due to boggy ground conditions, indeed part of the northern section has sunk into the ground. There are traces of an external ditch at the north side measuring just 0.4 metres and, at the north-west just under 1 metre. During excavations in 1990-1 before the road was widdened into a dual carriageway, an external ditch at the eastern and western sides was found. This was some 2 metres wide and just under 1 metre deep with a berm of 1 metre in width. Near the north-east corner of the camp there is what is probably a Bronze-Age stone circle, something the Romans had clearly taken in to account. There were at least 9 gateways (tituli) each being about 10 metres in width at the north, south, east and western sides of the camp; however, at the south-western side a couple of the south-eastern gateways have been obliterated by the A66 which bisects through this lower part of the earthworks, and recent limestone quarrying has not helped the situation. Three gateways at the north-side are still visible today. Close to the south-western side there is a small mound which sits where the quarrying occured, although this feature has, luckily, survived. This may well have been a small signal station? – there were others in an alignment sited at intervals along the Roman road, now the A66. 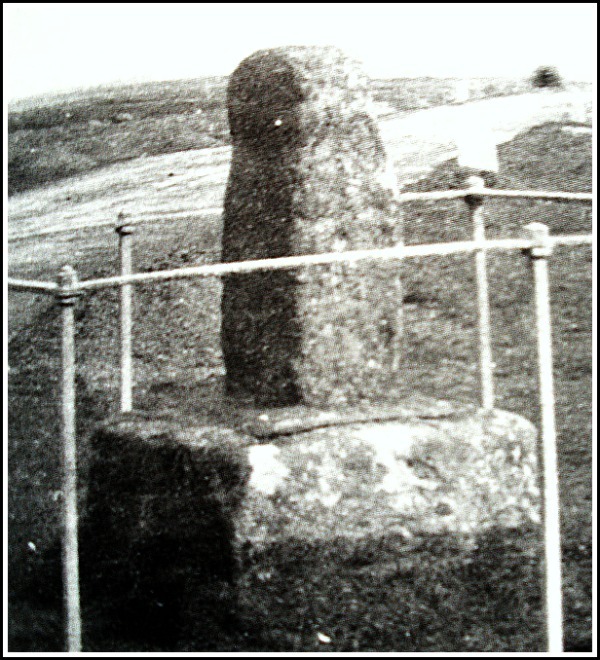 In a lay by at the side of the A66 to the east of the Roman camp stands the stump and base of an Anglo-Saxon cross (Rey Cross), dating from c946 AD when it was set up by King Edmund of Northumbria to mark the boundaries between his own territory and Cumbria (Strathclyde). However, legend says that in c954 the Viking ruler of York, Eric Bloodaxe, fled from York into Cumbria, being murdered and buried here at that time. There is no evidence for that. The cross originally stood within the Roman camp, but in 1992 it was re-located to its present position when the A66 was widened. Sadly the wheel-head and the upper section of the shaft have long since disappeared, leaving just the worn stump socketed into a more modern lump of stone or concrete. The cross would originally have been 3 metres high. Today there are no signs of any Saxon carvings, the inclement weather conditions upon Stainmore having put paid to that. Wilson, Roger J.A., – A Guide to the Roman Remains In Britain (Fourth Edition), Constable, London, 2002. Transactions of the Cumberland and Westmorland Antiquarian and Archaeological Society (TCWASS), (2nd Series) xxxiv (1934) pages 50-61. Categories: Ancient Crosses, Rey Cross Roman Camp Stainmore Cumbria, Roman Sites | Tags: Rey Cross Roman Camp at Stainmore in Cumbria | Permalink.